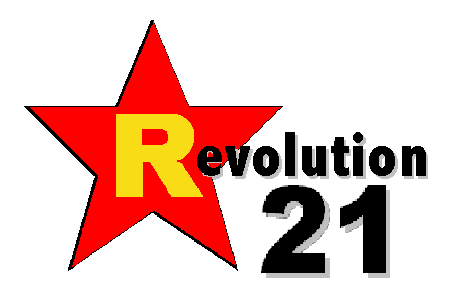 Revolution 21's Blog for the People: Integrity . . . what a concept! In television news anymore, the most common "I" word is . . . I. As in . . . "I will do anything for ratings." Or, "I was the emcee for the Bratz Appreciation Society's "Tart Up Your Tykes" event today, so here's a minute of airtime devoted to that instead of real news." Or, "Did I look OK in that outfit? It didn't make me look fat, did it?" Less common on local TV these days is another "I" word -- "integrity." As in, "Management is treating employees really badly, and it's trying to get us to slant the news. Integrity demands that we not go along with this and bring attention to bad practices -- even if it might well be career suicide, especially amid media contraction and in this economy." THAT'S the "I" word we're seeing play out here, live and local, as the anchor team for Bangor's WVII television -- one of them the station's news director -- quit at the end of the 6 o'clock news Tuesday. Most people probably will say theirs was a supreme act of stupidity, that no one in their right mind will hire them now. “I just wanted to know that I was doing the best job I could and was being honest and ethical as a journalist, and I thought there were times when I wasn’t able to do that." I say that integrity is its own reward, even when it involves sacrificing one's career. Doing the right thing rarely makes you rich. Sometimes, it can get you killed. And in the wake of Cindy Michaels and Tony Consiglio's most public of resignations from WVII, lots of people in Bangor -- and across America -- now know something's rotten in the state of television in that city. It certainly got the immediate attention of that city's newspaper, the Bangor Daily News, and other media sites. That's not nothing. Michaels and Consiglio, who have a combined 12½ years’ service at WVII (Channel 7) and sister station WFVX (Channel 22), shocked staff members and viewers with their joint resignations Tuesday evening. “I just wanted to know that I was doing the best job I could and was being honest and ethical as a journalist, and I thought there were times when I wasn’t able to do that,” said Consiglio, a northeastern Connecticut native who broke in with WVII as a sports reporter in April 2006. Not everyone was shocked by the on-air resignations. Neither reporter had told anyone of their decisions before Tuesday’s newscast. “We figured if we had tendered our resignations off the air, we would not have been allowed to say goodbye to the community on the air and that was really important for us to do that,” said Michaels, the station’s news director, who has spent six of her 15 years in Bangor’s radio and TV market at WVII. Both Michaels, 46, and Consiglio, 28, said frustration over the way they were allowed or told to do their jobs — something that has been steadily mounting for the last four years — became too much for them. While choosing not to respond to individual complaints or charges, Palmer did take issue with the former anchors’ characterization of management’s role. Michaels said there were numerous things that contributed to their decisions. MAYBE the anchor duo will get lucky. Maybe Michaels and Consiglio will come out ahead financially and careerwise amid the fallout of their televised quitting. Then again, maybe not. If not, standing up for what's right, and the self-respect that comes from that, will have to suffice. Like it says in the Bible, sometimes your reward will have to wait till kingdom come.